Popular classic styling, these 6' and 8' E-Series expanded metal park benches are an economical solution for outdoor public seating. The virtually maintenance free 10" perforated or diamond pattern seat and bench plank is supported with a sturdy 2-3/8"O.D. steel tube frame. 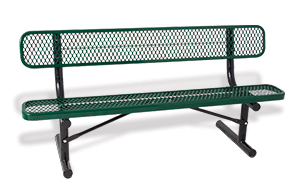 Finished in an impact resistant, non-corrosive thermoplastic and powder-coating, the E-Series all-steel park benches will continue to look and perform well over the years. Designed to fit a variety of applications, the E-Series 6' and 8' flat bench is available in portable, surface or in-ground mounting options. ► Items ship within 48 hours on orders up to 4 units with select color options (as shown) only.